s most of you know, my favorite design blog is Design For Mankind and Erin is the featured blogger this week. 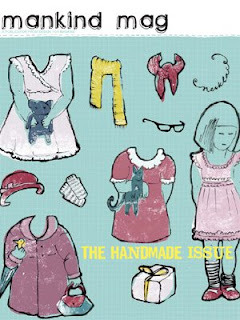 Her fifth issue of Mankind Mag came out last week and it's focus... handmade. As often as possible I buy handmade goodies for friends and family as gifts, the items are so much more personal than stuff from a big box store. Plus, you can then support artisans whose work you adore rather than a faceless corporation. So, I just loved perusing this issue. Oh, and she interviewed Claudia Helming, the founder of DaWanda. I just love DaWanda, I could lost in it for hours! I love the cover of this months mag so much, that I didn't try to pull together snippets from throughout the mag like I usually do, but then I've always been a fan of paper dolls. Go check it out! I'm so demanding, aren't I? I'm doing the same. Not sure how well it will be received, but I'd much rather support artisans than big box stores. Me too! I think my family will deal with it well. Ahhh cool! I downloaded that issue a few days ago. It's excellent!